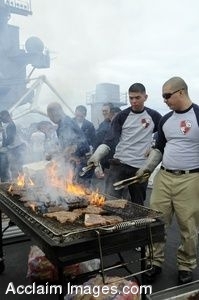 Description: Clip art photograph of Members of the "3 and 2 Association" grill steaks on the flight deck of the Nimitz-class aircraft carrier USS Ronald Reagan (CVN 76) during a steel beach picnic held for friends and family during Tiger Cruise. The "3 and 2 Association" is comprised of 3rd and 2nd Class petty officers who work to improve the morale of Sailors aboard Ronald Reagan. More than 1,200 friends and family members embarked Ronald Reagan for six days as part of "Tiger Cruise" to experience life aboard an aircraft carrier. Ronald Reagan is on a routine deployment, operating in the 3rd Fleet area of responsibility. (U.S. Navy photo by Mass Communication Specialist 3rd Class Chelsea Kennedy). Clipart photograph by Department of Defense Public Domain.